Of course some goalkeepers are more active in the air than others. The most active goalkeepers dealt with c. 15% of total crosses – Weidenfeller (15.2%) and Neuer (14.9%) – while the least active dealt with c. 6% – Sippel (6.4%) and Mondragon (6.2%). If we look specifically at the most dangerous crosses, the crosses into the six yard area, the average goalkeeper deals with only 32.8% of them and even Manuel Neuer, arguably the strongest goalkeeper in the world when it comes to aerial ability, deals with only 52.5%. The relevant point is that even the most active goalkeepers deal with only a small minority of crosses. In addition to the low volume of aerial contributions there is also the question of how valuable each contribution actually is. Intuitively it seems clear the value of the average cross is very low. The three-way parlay of finding a teammate, getting a shot on target and the shot resulting in a goal is very unlikely. According to a stat from @Orbinho via @11tegen11 in the Premier League the average cross leads to a goal only 1.6% of the time, so the value of a cross is 0.016 goals. If the value of a cross is so low then the value of a goalkeeper dealing with that cross must also be low. If the average goalkeeper claims two crosses per 90 minutes and the most active goalkeepers claim just under three (Neuer 2.75), then the value of being elite at claiming crosses is c. 0.015 goals per match. Contrast this to shot stopping were the value of being an elite shot stopper is c. 0.2-0.3 goals per match. In summary, crosses are a high volume low value action. Even the most active goalkeepers deal with only a small minority of total crosses, and each contribution has only a small value. The value of preventing shots by dealing with crosses pales in comparison to the value of shot stopping. Something I didn’t address is the psychological benefit of having a goalkeeper who is good in the air on your team. I can’t speak from the perspective of a high level player but as a fan I know having a goalkeeper who is poor in the air fills me with fear and worry, and having a goalkeeper with a strong aerial presence has some positive value beyond simply the value they create by dealing with crosses. However I find it very difficult to believe that value could ever be enough that I would rather have an elite aerial contributor than an elite shot stopper. I would also add that my view on the psychological benefit is that it comes not so much from dealing with a lot of crosses but more from simply not making any mistakes when you do deal with them. There are few things more frightening in football then seeing your goalkeeper flap at a cross, and that can have a negative effect on a team’s confidence. I don’t think a goalkeeper who mostly stays on his line but when he does deal with crosses does so confidently would have anywhere near the same kind of negative effect. I would have used the first 17 rounds to get the full first half of the season but the data for the 17th round was unavailable. The sample is also missing the match between Mainz and Stuttgart from the first round due to incomplete data. Goalkeepers do also drop some crosses (roughly 1 in every 20 matches on average according to the data) and sometimes come for a cross and miss entirely which is not reflected in the data (some keepers more than others of course) which would increase the actual value by a few tenths of a percent. In this post I will look at the performance of Chris Smalling, Jonny Evans, Rio Ferdinand and Nemanja Vidic in the 2010/11 Premier League season using data gathered from the Guardian Chalkboards, but before I do so I feel the need to make a few points. 1. These numbers are not meant as a definitive measure of a player’s performance. 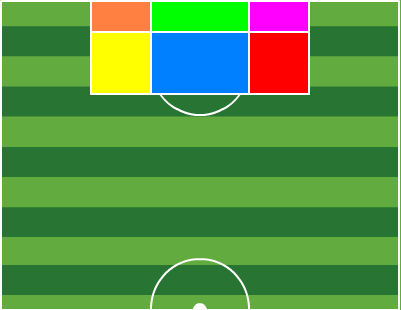 Defending is a very complex art and it would be silly to suggest that it could be summed up with a few simple metrics. As is always the case, these numbers should be used to supplement the eyeball test, and in cases where the results differ from your observations they should be used as a test – is there a reason the statistic could be wrong? is there a problem with how the data is gathered? is it possible the statistic is right and I’m wrong? – to make sure your observations are sound. I will touch on this point again later in the post. 2. The sample sizes used here are very small so everything should be approached with the appropriate level of skepticism. The total minutes included for each player is as follows: Vidic – 3118, Rio – 1710, Smalling – 1037, Evans – 871. 3. I include in these numbers only minutes played at center back which means Evans and Smalling are missing some minutes they played at left back and right back respectively. 4. I have omitted from the data all passes made in the last ten minutes of the Blackburn away match since it was a highly unusual situation and to include those passes would pollute the sample with data that is not a true reflection of a player’s game. 5. I haven’t included Wes Brown’s minutes because he only played one match at center back. Evans was the most active passer, completing on average 43/50 passes per 90 minutes. 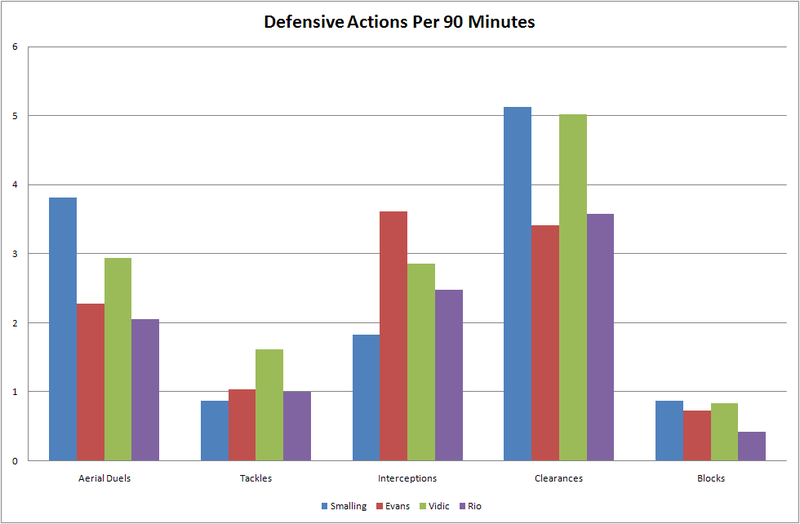 Vidic and Rio were next with 38/47 and 37/46 passes respectively while Smalling brought up the rear with 30/40 passes. Note however that Evans played a disproportionately large 61.5% of his minutes in home matches, so you would expect his passing numbers to be slightly inflated. Smalling played 45.5% of his minutes at home so his actual numbers may be slightly higher than they seem. Vidic played 48.0% of his minutes at home while for Rio the corresponding number was 52.6%. 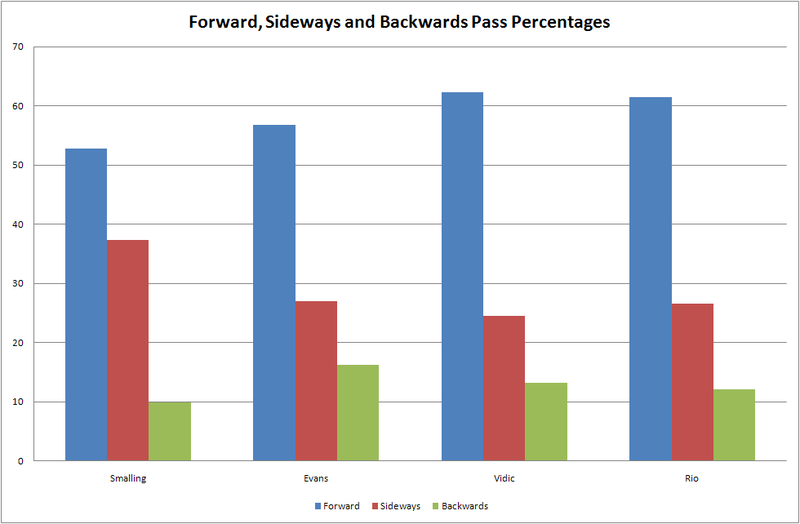 In the graph above I have separated each players passes into forward, sideways and backwards passes. 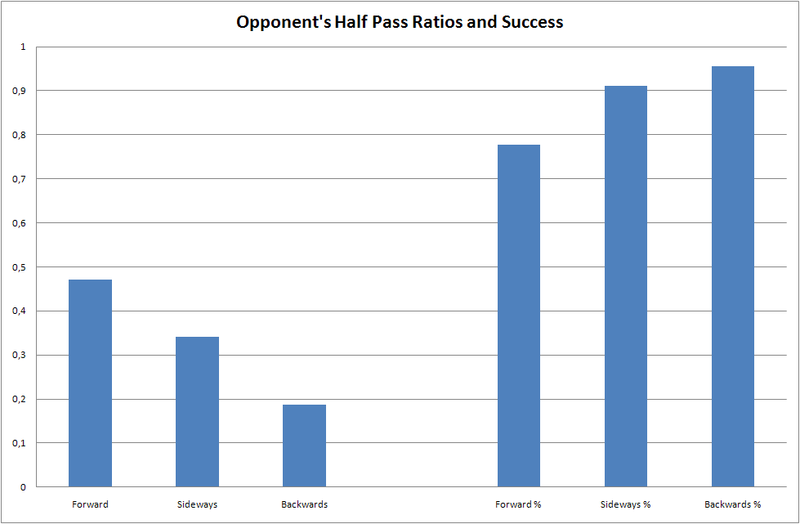 As you would expect each player plays the majority of his passes forward. Vidic is the most frequent forward passer with 62.3% of his passes going forward. Rio is close behind with 61.5%, Evans is third with 56.8% and Smalling last with 52.8%. 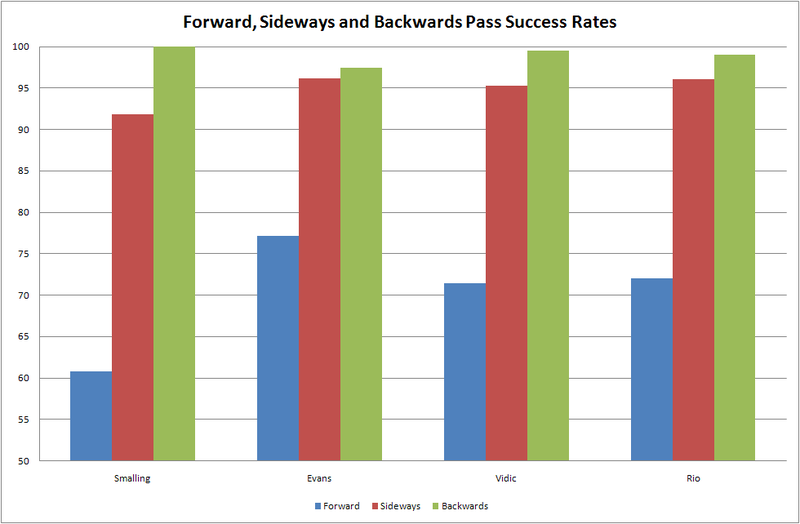 When it comes to sideways passes Smalling is clearly ahead of the rest with 37.3% of his passes directed sideways. Evans, Vidic and Rio are all close together with 26.9%, 24.5% and 26.5% respectively. Smalling plays the fewest backwards passes, 9.8%, while Evans plays the most, 16.3%. Rio and Vidic are close together with 12.0% and 13.1% respectively. In addition to attempting the fewest forward passes Smalling is also the least accurate forward passer, completing only 60.7% of his forward passes. Evans is the most accurate at 77.2% while Vidic and Rio are very close with 71.4% and 72.0% success rates respectively. When it comes to sideways passes Evans, Vidic and Rio are all close, completing 96.2%, 95.2% and 96.1% of their sideways passes. Smalling is slightly less accurate at 91.8%. 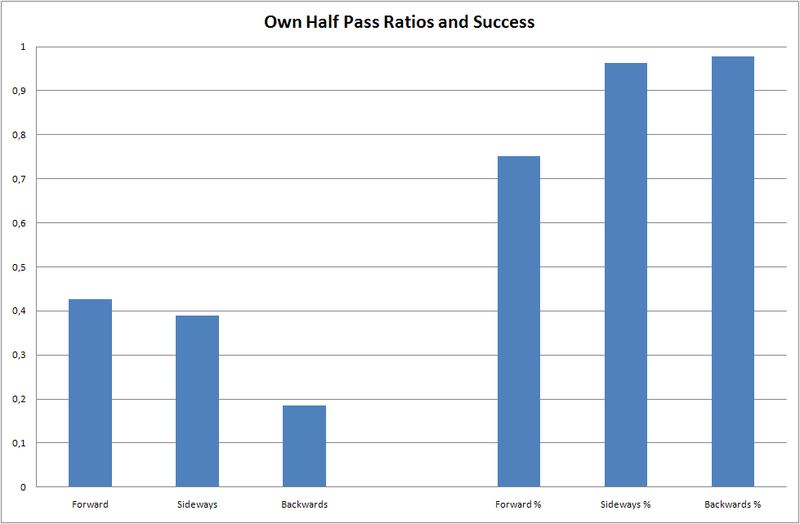 Each player’s backwards pass success rates are very high, as you would expect and hope. Needless to say these numbers don’t tell us everything. For example they tell us nothing about the ratio of long, medium and short passes a player played. They also tell us nothing about how difficult each attempted pass was, or about how much pressure the player was under when they attempted the pass. This is where combining these numbers with your own observations from the eyeball test becomes important. The graph above shows each player’s successful aerial duels, successful tackles, interceptions, successful clearances (both headed and non-headed) and blocks per 90 minutes. Smalling was the most active aerial dueler, attempting 5.2 aerial duels per 90 minutes and winning 3.8 or 73.3%. Rio was the least active, attempting 2.7 and winning 2.0 or 75.0%. Vidic won 2.9 out of 4.3 attempted aerial duels for a success rate of 68.4%. The weakest in the air was Evans who won only 2.3 of 4.6, a success rate of only 50%. On the ground Vidic was both the most active and most successful tackler. He won 1.6 of 2.0 attempted tackles, a success rate of 78.9%. The second most successful was Rio who won 76.0% of his tackles, 1.0 of 1.3. Evans won 1.0 of 1.4, 71.4%. The weakest tackler was Smalling who won only 58.8% of his tackles, 0.9 of 1.5 attempted. Evans made the most interceptions, 3.6 per 90 minutes. Vidic, Rio and Smalling won 2.9, 2.4 and 1.8 respectively. Smalling made 5.1 successful clearances per 90 minutes out of 8.8 attempted, a success rate of 58.4%. 68.3% of his clearances were headed. Vidic was successful in 5.0 of 9.7 attempted clearances, or 51.6%. 60.8% of his clearances were headed. Evans attempted 8.0 clearances per 90 minutes but succeeded in only 3.4 of them, a success rate of 42.8%. 64.9% of his clearances were headed. Rio attempted the fewest clearances, 6.9, and was successful in 3.6 of them, or 51.9%. 54.2% of his clearances were headed, 45.8% non-headed. Smalling made the most blocks, 0.87 per 90 minutes. Vidic, Evans and Rio made 0.84, 0.72 and 0.42 respectively. Smalling won and conceded 0.95 and 0.87 free kicks per 90 minutes. The corresponding figures for Evans were 0.93 and 1.24 and for Vidic 1.01 and 1.15. Rio won 0.53 but conceded only 0.16 – just 3 free kicks conceded all season. Are these numbers meaningful? Can we use them to answer questions like who is the better player, who performed better over the course of the season? Take Evans and Rio. Evans completed more passes, won more aerial duels, won more tackles, made more interceptions, made the same number of clearances and made more blocks. The logical conclusion then is that Evans is the better player, yet anyone who has watched Manchester United play could tell you that Rio is by far the better player, and was also much better over the course of the season. These numbers alone are not enough to make judgments of relative worth and value, but that doesn’t mean they are useless. Used in the right context and as a supplement to the eyeball test they can have value. For example, knowing that Evans won only 50% of his aerial duels is valuable because we then know this is an area he has to improve on. I don’t need the stat to know that Evans is poor in the air – I can see that with my own eyes – but having the stat reinforces the point. If simply looking at the stats isn’t enough to tell us who is the better player we need to find other ways of answering the question. One way is to look at how many goals a team concedes when the player is playing. While this method also has obvious flaws and limitations I decided to include these graphs anyway. The first graph shows how many goals the team allowed per 90 minutes when each player was on the pitch. The second graph shows how many goals the team allowed per 90 minutes when a certain center back partnership played. Even though they do gel well with the eyeball test I wouldn’t put too much stock in these. For reference the number of minutes played by each partnership is as follows: Vidic/Evans – 673, Vidic/Rio – 1594, Vidic/Smalling – 851. Evans/Rio, Evans/Smalling and Brown/Smalling also played together this season but the sample sizes were so small they were of no value and so I omitted them.